Until now, Sellers could indicate the ability to export by checking a box on their profile. While helpful, this neither specified where they exported to nor did it provide any kind of search capability. This enhancement addresses both of those issues. Buyers can now see where a Seller exports to on their store page and limit their searches to Sellers who can ship to them. In the example shown above, we first navigated to the European MorphMarket (using the flag in the upper left corner). 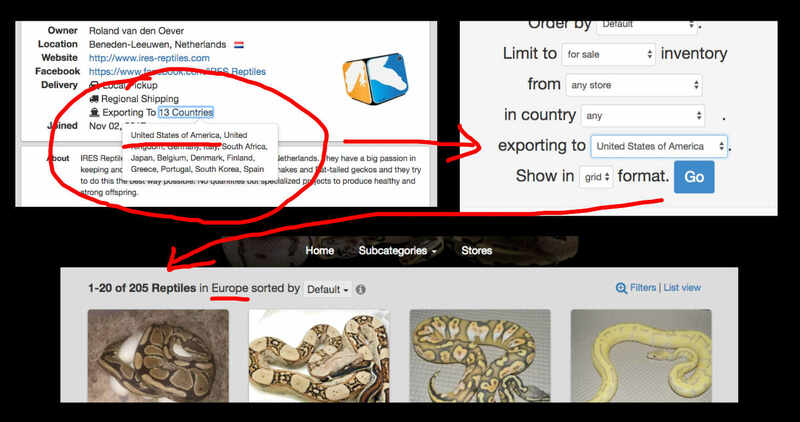 From there we can see that IRES Reptiles can export to the US among other countries. Finally, we changed the search filters to find all items from IRES and other Sellers exporting to the United States. Buyers in the rest of the world can likewise visit the MorphMarket US (North America) site and limit to items that can be exported to their country. While this update does not make items visible from one region in another, it's a necessary step in that direction. Sellers who have not already done so should update their profile to indicate all countries they are able to export to.